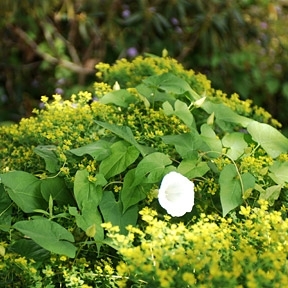 Bindweed or in if you studied at Eaton; Calystegia Sepium, does look pretty I know but it is definitely an unwanted intruder! Choking plants with its alien like twisting stems and trumpet white flowers. Do not let this plant fool you it will grow up to 6 feet in a single growing season and latch onto anything in it’s path. 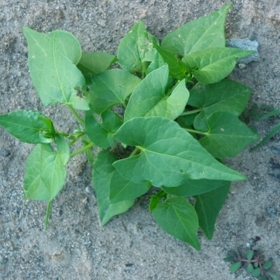 As the bindweed invades your garden with its intertwining and smothering of plants and bare soil you will see that it needs to be eradicated as quickly as possible, removing the plant from the root which can grow deep. As a temporary control, you can hoe these little latch on’s at ground level and repeat the process throughout the growing season. By consistently cutting off foliage it will hopefully stop the photosynthesis process and therefore kill the plant. For best results fork out the weeds when you see them in summer months as young plants and remove as much roots as possible. When autumn and winter digging, gently pull out the roots as you see them. Be careful when doing this as the fine, milky white roots can be easily broken and will reproduce. It is possible to get rid of these weeds in a few years by these methods but seeds and roots can remain dormant underground for a number of years it can be a tricky business, your commitment is needed. This is a harsh chemical and will kill any plants in it’s path so make sure you are selective of where you spray. Be careful of drifting spray onto wanted plants and neighbor’s gardens. Always read the label. Complete this task during flowering season, which is summer. Spraying in the evening has been known to be more effective or try painting onto the leaves. Why not try pushing a bamboo cane into the ground where the bindweed is commonly found in your garden which encourage it to grow up the cane and you can manage it from then on with your chosen method of eradication. Bind weed is a very intrusive plant and not easy to remove, this is why we select our topsoil from areas free of Bindweed and Knotweed more info.